It's easy to be self-conscious about the way we express our thoughts or feelings to others -- especially when it's someone with a learning difficulty. If you have dyslexia, it's normal to feel anxiety when talking about it. Anything that's not considered "normal" always makes us anxious -- all of us just want to fit and be accepted in society, right? Suspect you may be #dyslexic? Take this online #dyslexia test! Luckily, times are changing with dyslexia -- it's becoming rightfully perceived as something that doesn't define you as a person, but rather as a circumstance you're living with. Just like if you have high blood pressure -- it's not something you'll get marginalized for! 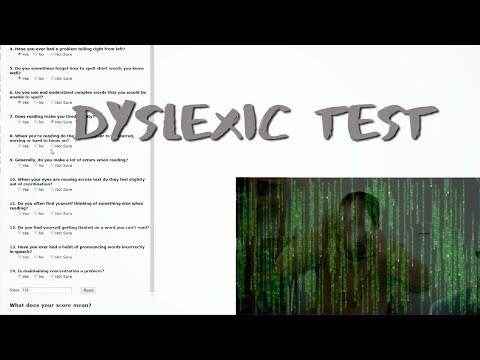 So if you do suspect you have dyslexia, take the dyslexic test in this video below! Check the symptoms, and do something about it. And experience the relief of knowing you can identify and treat your problem -- it's a big burden to take off your shoulders. When I was in school, I used to have a diary or something, and any hard words I didn’t know, I would write them down and find out what they are. Everyone wants to see their friends overcome a learning difference in their lives. Take the Dyslexia test to evaluate whether people might have the learning difference. Dyslexic students find it hard to read, particularly at their grade level. Take the Dyslexia test and get to know more about the learning difference itself.